Close to 1,000 people are expected to visit Gloucester Cathedral on Saturday 13 June at 4.30pm, to give thanks for Bishop Michael Perham’s ministry as Bishop of Gloucester. Guests will include church-goers from every area of Gloucestershire, up to 100 visitors from outside the Diocese of Gloucester, as well as many well-known local civic and business leaders. All are invited to worship together and enjoy a drinks reception afterwards. The service marks the end of Bishop Michael’s ten year ministry in the Diocese of Gloucester. During his time in office, Bishop Michael was involved with a number of charities, including GARAS, GEAR, Cheltenham YMCA, the Star College and Emmaus. Whilst in office, Bishop Michael had a significant impact on the national Church. He joined the House of Lords in 2009 and was Chair of the Society for the Promoting of Christian Knowledge (SPCK) from 2007 to 2011. One of his interests is liturgy and he was part of the group that put together the Common Worship service used in many Anglican Churches today. Bishop Michael was a member of the Crown Nominations Committee that chose the current Archbishop of Canterbury, Justin Welby. 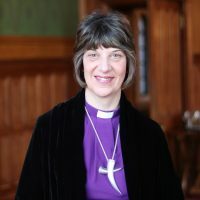 He has been a long standing supporter of women bishops and welcomed the appointment of Rachel Treweek as his successor in a BBC Radio Gloucestershire interview with Steve Kitchen. Bishop Michael retired in November 2014 and has since moved to Somerset with his wife Alison. He continues to minister to his local community in his role as a Retired Bishop. Bishop Michael will be on BBC Radio Gloucestershire on Sunday between 8.10am and 8.40am.